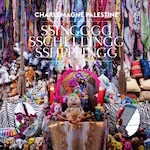 Prizes for most stupid album title of the week (possibly ever), go to Charlemagne Palestine, who has a ridiculously lengthy back catalogue. For all the ridiculous posturing the title and bizarre cover represent, this one-track album covers a wised ground of sound. With a soaring ambient tension, the title (and obviously only) track raises in pitch with layer upon layer of other sound sources applied, as you would, icing to a cake. Over the course of the CD, the noise becomes a cacophony of visceral pulses and applied pressure; and musically this works to perfection. However, there is one issue I have with this album; and it’s a big one. ‘Ssingggg Sschlllingg Sshpppingg ‘ is ultimately made unlistenable, due to the odd array of shamanic warbling nonsensical vocals that interrupt the track at its key points. So ludicrous that they are hilarious; and I don’t do humour with my music (even more worrying that I think they’re done in sincerity). Remove the vocals and this release would have made it onto my hi-fi time and time again. As it stands, because of this, the marks have dropped; and the chances of me listening to this again, verge on nil. I have to be honest, it’s rare I come across anything by Z’ev and say anything positive. I know and respect the man for his long tenure within Industrial and ambient circles, but have always struggled to enjoy much of what he has been involved with on a personal level. However I am open minded enough to listen to any release that drops through my door and the inclusion of another artist can bring another worthwhile edge to engage with. 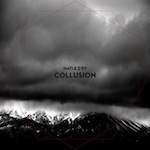 Once again there is a heavy level of percussion involved, as with any Z’ev release; along with Hati there is an ambient formulation over the analogue field recordings like sounds and a leaning towards tribalism and trance inducing hypnotic states. The tracks are untitled and in their anonymity I feel they should be treated as a whole. Track one doesn’t change from start to finish and whilst competent does grate a little from the scratching’s of noise that are evident from start to finish. The persistent tom that is beaten throughout the first number carries on into track two and this pretty much carries on from where the first song left off, carrying weight to the notion that individual tracks mean nothing on their own, hence the lack of titles as mentioned earlier. Much of ‘Collusion’ is disjointed with the percussive mass on occasion just clattering into a wash of sounds that for me sounds nothing more than a Tibetan monks hut at the top of a mountain falling to pieces in a storm. I can understand in some respects why some people do like this form of music, but for me, Z’ev (and in a lot of cases his colleagues) has always bordered too much on hippy aesthetics and I can barely see where his legendary status in Industrial circles has come from. Low-key ambience, field recordings and sub bass thumps open up this one-track album from Franck and Hilton. Inspiration is sourced from mysterious French poet Jacques Rigaut (1898-1929); although as is usually the case with non-vocalised music, unless you are the artist yourself it’s unlikely you will pick up on anything relating to the subject matter. In parts the music is haunting and does hold a sinister edge; and in it 42 minute plus journey it is quiet surprising how quickly the time passes. It’s all too easy to bore people when approaching music in this manner but Belgium born Franck and US based Hilton manage to hold fort with the atmospherics creeping up at key positioning’s within the track itself producing a cohesive and enthralling mass of interrupted spaces to engage with. For the most part, ‘Flowers For L.P.’ teeters around Dark Ambient circles and this is where I feel their fan base for this release is most likely held. There are momentary spots of light that hold the listeners head just above water as not to let them drown and this is where the true magic lies as a whole with albums of this nature.